Today, we have a special announcement regarding the VBP Blog Hop. On January 17 of this year, Jet, Savannah, and I started a blog hop called VBP – Vocab Building Project (Check above link for more information). We had lots of fun using new words, and I loved looking for French/English idioms (VBP) that were similar or not and which included the word cat. Unfortunately, life being life, we cannot get the energy needed to continue it right now. So we have decided to stop it, at least momentarily. Jet and his human, for coming up with the original idea for the blog hop! We’re sending you lots of purrs and hugs! Savannah and her human, for their perseverance (VBP) and patience, and for posting when we couldn’t. We send you hugs and purrs too! Miss Ann from Zoolatry for creating all the graphics that you see on this post, as well as the badges. Again, hugs and purrs! Last but not least, thank you to all the furriends who pawticipated! We hope you had fun in the process. We certainly loved reading your posts! Lots of purrs! A special shout-out to The Tabbies O Trout Towne for participating to all but 2 of the total of 11 hops! Thank you! Lots of purrs! And salmon! P.S. : If you had planned a VBP post and plan to post it, please post the link in the comment and I will post a link in a post next week. Thank you furry much for your understanding! I want to thank all our furry and human furriends for their support. Your comments, tweets, posts, thoughts, purrs, purrayers, every kind gesture, were appreciated beyond words. THANK YOU. 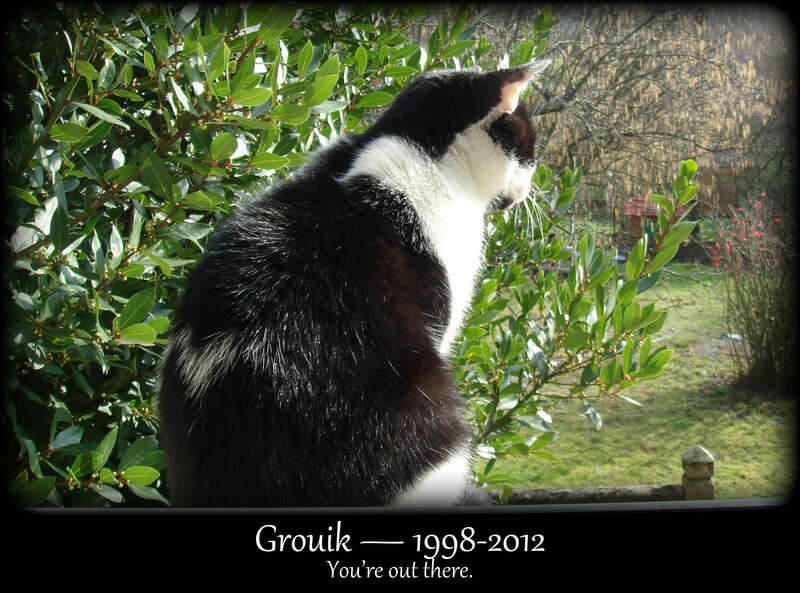 The humans want to take some time to pick up more pictures of Grouik for his special page. In the meantime, here is one of Grouik’s human favorite pic (and activity) of our beloved Grouik. We also would like to thank Savannah and her Mom for their kindness and for taking the initiative to ask Zoolatry to create 2 special badges for Grouik. Thank you to Zoolatry for such a nice job! Please visit their site if you haven’t already! Thank you to those who blogged about Grouik: Wheezyrider, Savannah, Alasandra. We are really moved by the kindness of the furry community that reached out to us these past few days. We are not surprised, but we certainly are moved. 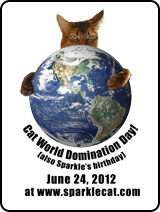 More Awesomeness from my Furriends! 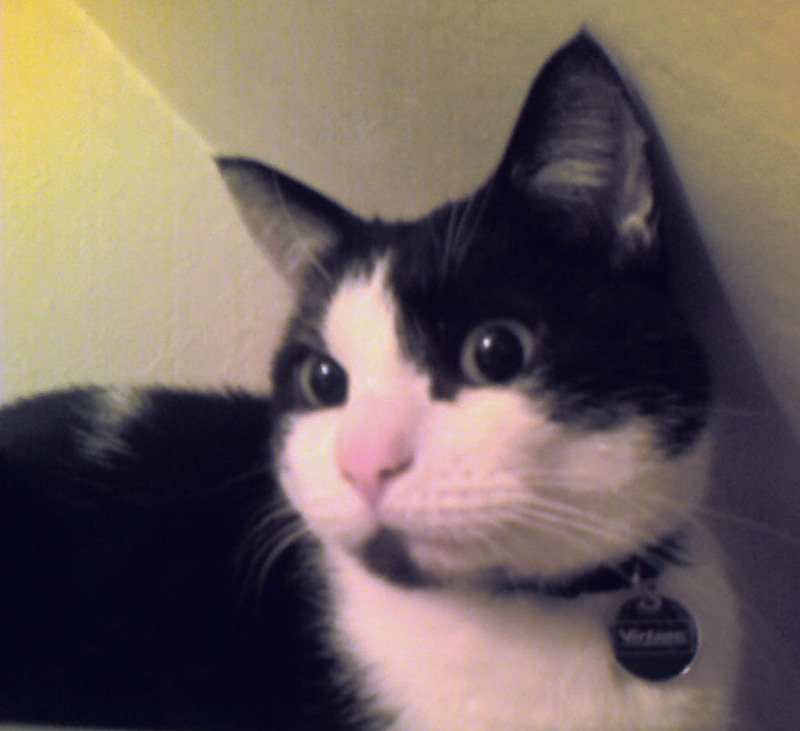 I am very moved by your nomination and I thank you so very much with many purrs! Indeed Miss Lisa nominated me for the Blog on Fire Award! I have to admit though that my human had to explain that my blog wasn’t actually on fire and why it was a pretty cool award! Thanks again Miss Lisa! You rock! 1. I said earlier that “I don’t want humans to call me red (to quote my human, I am white and cream colored).” Sometimes my human also says I am Caramel Macchiato. 7. Once I licked olives on the humans’ table and they never suspected it! And I’m going to ask my human to notify them as soon as this post is posted! Since I had already received it, I will not go through all the process but I’m sending purrs to my furriend Jet! And for those who read all this, here is an old picture of me from when I was in France! I liked to pretend that I was a pirate! Have a purring Sunday everyone! Purringly surprised and happy: two more awards! My good furriend Savannah has so kindly bestowed two awards on me and my little blog: One Lovely Blog Award and the Very Inspiring Blogger Award. Thank you so very much, Savvy! Thank you so much, Savannah! I am too relatively new to the blogosphere and I don’t know so many people yet, so here are my 15 bloggers I admire. If you already received the award, well, consider receiving it a second time from Texas, who admires you ;-) I know some of you among the list are big stars on the Internet, and those awards probably don’t mean that much anymore but I still admire you, so there you go! Am doing this right after my nap, promise! Another award! The Versatile Blogger Award! I have to say that these past few weeks have been particularly exciting and I owe this to all my good furriends. I had already received twice the Sunshine Award + the Liebster Award last week. Now my good friends at Hutch A Good Life nominated me for the Versatile Blogger Award! Thank you so much guys! I appreciate it so very much and I’m sending you tons of purrs! Thank you so much to Nibbles, Nutty, Bingo, Buddy and their human! My first award: a Sunshine Award from CatPurrology! My first award, from a blogger peer. It means so much to me I can’t stop purring. Sally the Cat Protectress and Slash, from CatPurrology, brightened my day by bestowing me, Texas, with a Sunshine Award! My blog is not very old but I’ve already made plenty of new friends and Sally and Slash are among them. Thank you so much for everything you do. Many purrs to you! 1. Link the award to the person who gave it to you. 2. Answer the questions that come with it. 3. Pass it along to 10 people and let them know they have received it. My half-brother Grouik has not come back for 24 hours. Where are you Grouik? My human won’t let me go out now!